Every summer, photographers from all over the world gather in a small city in the south of France. 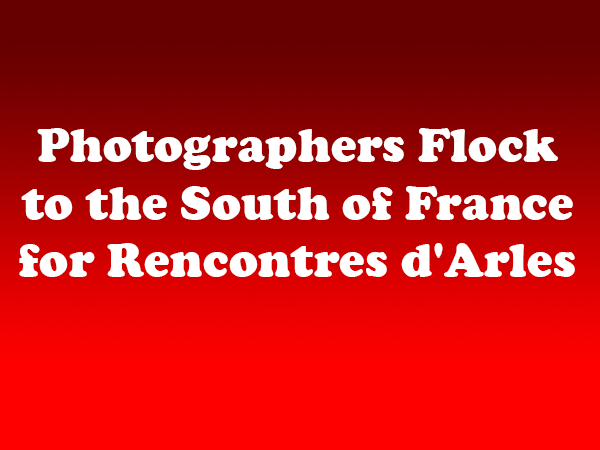 They go to attend a photography festival known as the Rencontres d’Arles (formerly known as the Rencontres Internationales de la Photographie d’Arles). Arles photographer Lucien Clergue, author Michel Tournier, and historian Jean-Maurice Rouquette first organized the festival in 1970, and it has since grown into one of the most unique and influential yearly exhibitions in the photography world. Because the Rencontres d’Arles has a policy of featuring almost exclusively new work, it is known for displaying groundbreaking work and launching careers. Every year, the festival attracts approximately 80,000 visitors. The exhibitions takes place at various locations across the city of Arles, from 12th century chapels to 19th century industrial spaces. In many cases, the historical buildings are only open to the public during the festival. The events are also diverse, including screenings, exhibition visits, discussions, symposiums, photo workshops, and book signings. Since 2002, the festival organizers have used the Rencontres d’Arles awards as a means of discovering and recognizing new talents. There are currently three prizes: the Prix Découverte (‘Discovery Award’), worth €25000, the Prix du Livre d’Auteur (‘Contemporary Book Award’), worth €8000, and the Prix du Livre Historique (‘Historical Book Award’), worth €8000. This year’s festival begins on September 20, 2015 and will feature several new changes. Most notably, Sam Stourdzé has taken over for François Hebel, the festival’s Director of the last twelve years. Under Stourdzé’s leadership, the festival has been redesigned and slightly compacted with 20 less exhibits. The exhibitions will be divided into six different sections: Rereading, Resonances, I am writing to you from a far off country, The platforms of the visible, Odd collectors and Emergences. The work of two American photographers, Walker Evans (1903-1975) and Stephen Shore (born in 1947), will be prominently displayed. Another Arles exhibit gathering buzz is Another Language, eight Japanese photographers.